After several years of nagging by friends and enemies, the Plokta cabal has finally decided it's time to run another convention. <plokta.con> will be a small, friendly SF con, and will held over the Spring Bank Holiday 2000. George is the chaircat, but otherwise, we're all mucking in on this one. This is not our first convention. We collectively formed the committees for the 1991 filk con and the 1995 Eastercon, and have individually run many other cons. A key element of <plokta.con> will be our small but perfectly formed programme, which will feature our Guest of Honour, Ken MacLeod. 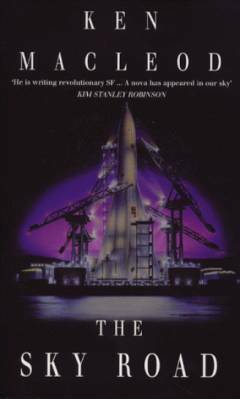 Ken's novels -- The Star Fraction , The Stone Canal , The Cassini Division , and The Sky Road -- blend cutting-edge SF with detailed political visions of post-capitalist societies. All in all, we reckon he's one of the UK's hottest SF writers at the moment, and we're delighted that he's agreed to be our guest. The cabal particularly enjoy small cons, and <plokta.con> is unlikely to have more than 150 members. Also, we don't believe in reinventing the wheel, so we're picking aspects of recent UK cons that we've really enjoyed. Like Seccon , we will have a single stream programme, with both SF and fannish items and lengthy gaps suitable for the partaking of large meals. But we also want to capture some of the light-hearted feeling that was such a success at Year of the Wombat , though preferably without the pump-action water pistols. And we want the con to have the sort of fannish ambience of the Miscons -- not to mention the real ale. The programe will run from around 7pm on Friday to 2pm on Monday. If there's anything you've ever desperately wanted to do on a convention programme -- talk about Omaha the Cat-Dancer , discuss chronosynclastic infundibula or just make an exhibition of yourself -- please let us know. We thought the fanzine room at Attitude was splendid, and we hope to have a repro room available for you to produce one-shots during the convention. The plan is that the superfluous technology in this room will spend at least part of the convention hooked up to the Internet, and we've got the Plokta resident mad scientist, Dr Plokta, working on setting up the vat of hecto jelly as a network printer. We would also like there to be a small dealers' room. Our hotel is the Holiday Inn in Leicester. This is slightly further north than we originally planned, but we like the hotel, which has large bedrooms, air conditioning and a health club. 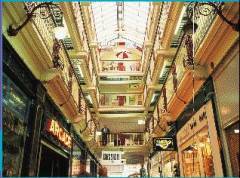 It's in the city centre, so is convenient for the many restaurants, pubs and shops. And it's hosted a couple of previous cons -- Star Trek rather than SF; but it means they know roughly what sort of event we are. The room rate is £27.50 per person for twin or double rooms and £37.50 for single rooms, including VAT and full English breakfast. An upgrade to an Executive room (king-size bed, larger and better furnished room) is £10 per person. Car parking and use of the swimming pool, sauna, jacuzzi and gym are free to hotel residents. Hotel booking information will be in the next issue of Plokta. Children under twelve can stay in their parents' room and eat breakfast for free, and the twin rooms actually contain two standard double beds. Parents can alternatively book an adjoining room for their children at £30 for the room. Accompanied children are very welcome, but we're too small to have formal childcare facilities. Leicester has lots to offer visiting fans; not least of which is a train every half-hour from London. It's a lively university town these days, with the good value and varied shopping and eating that implies. It has Britain's largest indoor covered market, modern and Victorian shopping arcades, and many excellent pubs and restaurants. However, it was once a Roman trading post, Ratae Corieltauvorum, and there are many Roman antiquities in the town's museums, along with the largest dinosaur in Europe. Nowadays, the town is cosmopolitan, with a vast range of architectural styles mingling ancient and modern. Memberships will cost you twenty pounds, at least until the end of the year. You can join by sending your money to <plokta.con>, 3 York Street, Altrincham, Cheshire, WA15 9QH, where our crack team of scantily clad fulfilment agents TAFF candidates will lovingly enter your details on our database. We won't be having traditional progress reports. Instead, you will be able to read about our plans for <plokta.con> in the pages of Plokta, which all con members will receive until after the convention. So you see -- a way to avoid having to send a loc for another few months.